Be the first to share your favorite memory, photo or story of Katherine "Kathie". This memorial page is dedicated for family, friends and future generations to celebrate the life of their loved one. 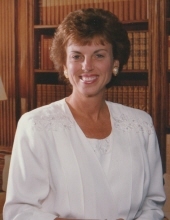 Mrs. Katherine King Dunbar, of Gainesville passed away at the age of 68 on January 19, 2019 at 4:59PM. Funeral services will be held Wednesday January 23, 2019 at 2pm in the Buford Chapel of Crowell Brothers Funeral Home located at 201 Morningside Drive, Buford, GA 30518 with Reverend Jeremiah Martin officiating. Interment will follow at Broadlawn Memorial Gardens, 5979 New Bethany Rd, Buford, Georgia 30518. The family will receive friends at the funeral home on Tuesday January 22, 2019 from 6:00 p.m. until 8:00 p.m.
Kathie is predeceased by her parents, Mason and Katherine King. She is survived by her loving husband, James E. Dunbar of 48 years. Also, by her daughter and son-in-law Amy and Mike Seco de Lucena and their children Hannah and Ryan; daughter and son-in-law Jody and Ross Bush and their children Brantly, Connor, Lindsey and Brayden; son and daughter-in-law Russ and Kellie Dunbar and their children Hunter and Aspen; Brother and sister-in-law Joel and Patti King; Niece and nephew-in-law Michelle and Haynes Martin; Niece and nephew-in-law Danielle and Andy Chilton and their son Benjamin. Kathie was born in Albany, Georgia on March 5, 1950. She graduated from Tucker High School in 1968 and went on to attend West Georgia College. She was a stay at home mom for her three children and later taught pre-school for several years. After pre-school, she became a kindergarten paraprofessional for 13 years. Once retired, Kathie enjoyed spending time on the lake and most of all spoiling her eight grandchildren. Kathie and Jim dedicated most of their time to anything their grandchildren were involved in; sports, school, and other events. She attended Christ Place Church and was very involved in her bible fellowship class. Her caring spirit and loving heart touched the lives of many. In lieu of flowers the family is requesting memorials contribution be made to the St Jude Children’s Research Hospital at 501 St Jude Place, Memphis TN 38105. Donations can be made online at www.stjude.org or by calling 1-800-822-6344 Monday - Friday 7:00 a.m. to 9:00 p.m.CT. Arrangements entrusted by Crowell Brothers Funeral Homes & Crematory, 201 Morningside Drive, Buford, GA, 30518. 770-945-9999. To send flowers or a remembrance gift to the family of Katherine "Kathie" King Dunbar, please visit our Tribute Store. "Email Address" would like to share the life celebration of Katherine "Kathie" King Dunbar. Click on the "link" to go to share a favorite memory or leave a condolence message for the family.